A pair of bespoke platinum blue and white diamond wedding rings. These stunning wedding rings have a very indivdual style and still work perfectly together. 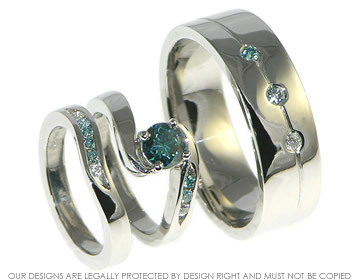 The ladies wedding ring enhances the organic twist style engagement ring by gently curving underneath the twist shown in the blue diamond engaggement ring. Reflectly the unusual leaf shape channel seen in the engagement ring we have applied this affect in the wedding ring by setting 6 1.5mm brilliant cut diamonds ranging fron two white diamonds twosky blue diamondsand two ice blue diamonds.The mans wedding ring has similar characteristics where the same combination of the ice blue diamond sky blue diamond and the white diamond all 2mm brilliant cuts have been invisibly set across the diagonal on an engraved line which runs all the way around the ring. The platinum wedding ring is 7mm wide with a flat with softened edge profile with a highly polished finish. A set of 9ct white gold engagement and wedding rings. 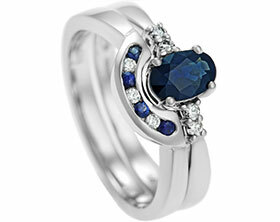 Platinum wedding band withdiamonds and sapphires. Bespoke 9ct white gold ladies wedding ring incoporating three 2mm brilliant cut H SI diamonds and two 1mm brilliant cut deep blue sapphires invisibly set all totalling 0.10cts. 18ct white gold band with tapered baguette diamonds totalling 0.09cts and a 2mm blue sapphire. Bespoke 18ct yellow gold fitted wedding ring with stones. Commissioned wedding bands in platinum with a combination of polished and satinised finish. 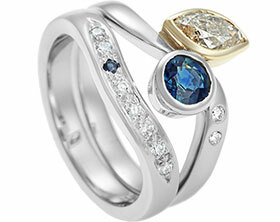 18ct white gold fitted wedding ring with a diamond and sapphire. 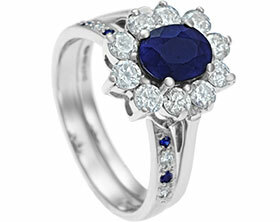 18ct white gold wedding ring with diamonds and sapphires.